Pack Fresh Collection has 2 Nolan Ryan Rookies & More! The year is 1968. A transistor radio propped in an open 3rd floor window blares out “I Second That Emotion,” by Smokey Robinson and the Miracles. Another radio, just a few windows over, offers the staccatic intro to The Rolling Stones’ newest single, “Jumping Jack Flash.” At ground level, on a small stoop, two teenagers are listening to Phil Rizzuto and Frank Messer calling play-by-play of the New York Yankees on WWHN. Up the street, several kids are finishing up a game of stickball and figuring out how to while away the rest of the sunny, early summer Saturday afternoon in Bayside Queens. A candy store on the corner of Francis Lewis and Northern Boulevard is one destination the stickballers target. The lads jockey for position at the candy counter, each eagerly passing their pennies and nickels across the countertop in exchange for some licorice pipes, gumballs, candy cigarettes and a pack of cinnamon toothpicks. One of the kids, walking a little further into the store, slides three nickels across the counter and receives three packages of baseball cards in return. As the stickballers disperse, the youngster with the baseball cards walks back to his home. Tearing open those tight wax seals and undoing the corner folds releases that distinct Topps gum aroma and exposes those burlap-styled cardboard gems with the goldenrod hued backs. Shoving the gum into his mouth, he starts thumbing through the small stack of cards. The names this summer read like a “Who’s Who” of baseball. Players such as Hank Aaron, Roberto Clemente, Mickey Mantle, Carl Yaztrzemski, Brooks Robinson, Bob Gibson and New York’s darling, Tom Seaver were spread through the set this year. But the players also read like a “Who the Heck is That?” with the likes of Sam Bowens, Larry Jester, Gary Roggenburk, John Tsitouris and John Buzhardt. And then there were the League Leader cards, the World Series cards, the All-Star card and of course, the Rookie Stars cards. You never knew which rookies were going to make it, but it was always great saving the cards of the home team’s youngsters. 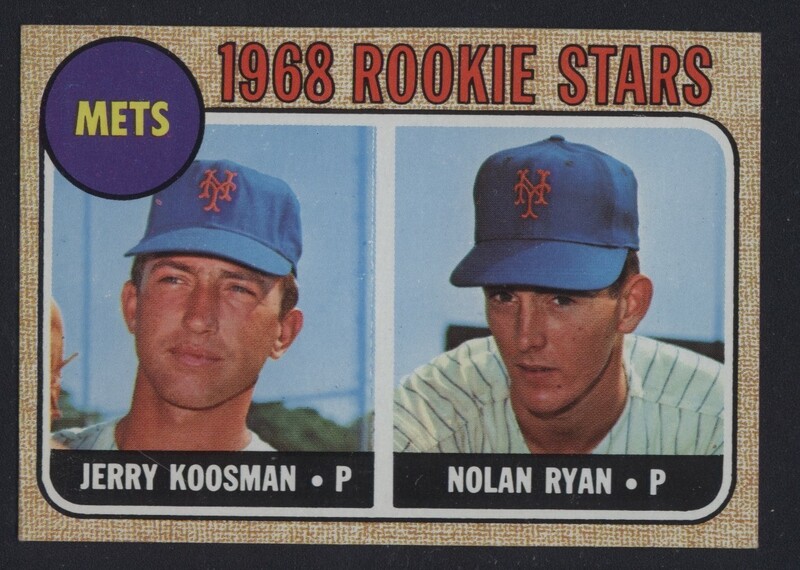 The 1968 issue proved to be a sound investment for those that hoarded the Mets Rookie Stars featuring pitchers Jerry Koosman and Nolan Ryan. The same can be said for the kids in Cincinnati that saved all of the Reds Rookie Stars with Johnny Bench. Growing up in a neighborhood where the children were fostered on National League baseball from parents still stinging over the departure of the Brooklyn Dodgers a decade earlier, our collector somehow became a Yankees fan. Not exactly common in Queens, which was home to the upstart Mets over in Flushing, but given that the Yankees and Mets weren’t winning much in the mid 1960’s, there probably wasn’t much rivalry amongst schoolmates and friends. Summer turned to fall in Queens and as the leaves began to fall, everyone’s fancy turned to the New York Jets with their charismatic quarterback, Joe Namath. Namath would lead the Jets to the AFL title and a showdown in the Super Bowl against the NFL’s mighty Baltimore Colts. Namath brazenly assured a victory and despite being a huge underdog, Namath and the Jets prevailed. The following year, the Mets would rejuvenate the city as they went on a miracle ride of their own. The Amazin’s won the World Series over the Baltimore Orioles. As the years passed, the young lad put the finishing touches on his collection as his fancy turned to dating and furthering his education, and squirreled them away. Somehow, the collection managed to stay securely hidden while the owner went away to Rockland County to attend college. Stashed away with stamps, coins and other collectibles from his youth, the cards waited and waited. Untouched and undisturbed. While the seller gained knowledge and real world experience, his cards, his connection to his youth and those days on the corner in Bayside, remained safe and secure and out of the sight and reach of the enemy of all of our childhood collections . . . an overzealous mom looking to clear space in dresser drawers and closets. A decade later, his collection now securely stashed in a shoebox in the trunk of a 1968 Oldsmobile Cutlass, he drove cross country to California to begin his life in the working world. Ironically, Nolan Ryan, the key player in the collection of 1968 cards, had also left New York for California in the infamous Jim Fregosi trade and preceded him to California by several years. While Ryan would leave California in a few years, the collection found its way into a safe for the next quarter century. Recently, our Queens native decided to return to the east coast to visit family in Philadelphia, visit with his daughter and take in a Yankees game at Yankee Stadium. He also decided that he would begin exploring options about selling his baseball card collection, or at least a portion of it. He read a few online stories about people that had sold their collections and actually was able to contact a man from the Midwest that recommended Just Collect, Inc. The seller emailed the company, spoke with Leighton Sheldon and began discussions about valuation, transportation and how Just Collect would handle such a transaction. Comfortable in the manner in which he was handled, the seller ventured east with his collection and eventually met Leighton at the Just Collect office in Somerset, NJ. The collection fared well over the decades, the miles and two cross country trips. 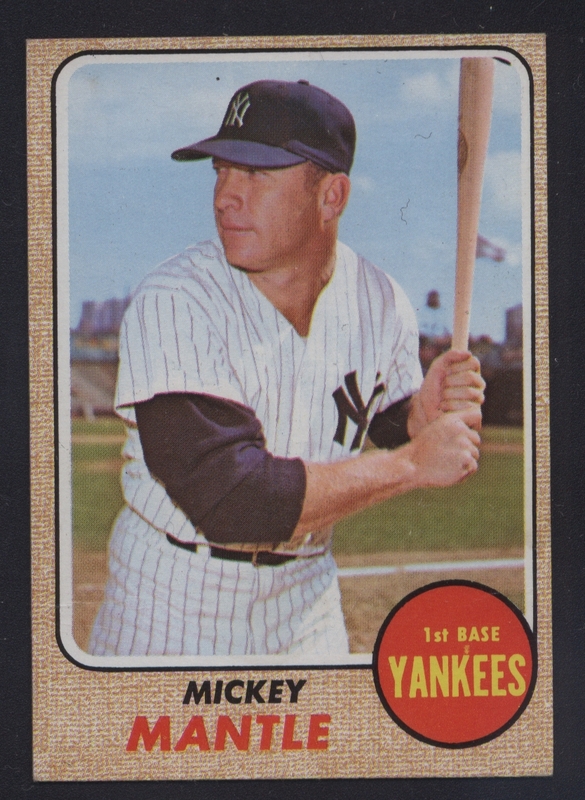 Virtually pack fresh and many still with the original wax stains, the cards had that fantastic feel that can be shared by those that recall opening those vintage packs back in the day. It is a feel that is distinct to fresh cards, to cards that have not been handled or passed through the rigors of a wide ranging collecting hobby. These cards were almost virgin in appearance and feel. 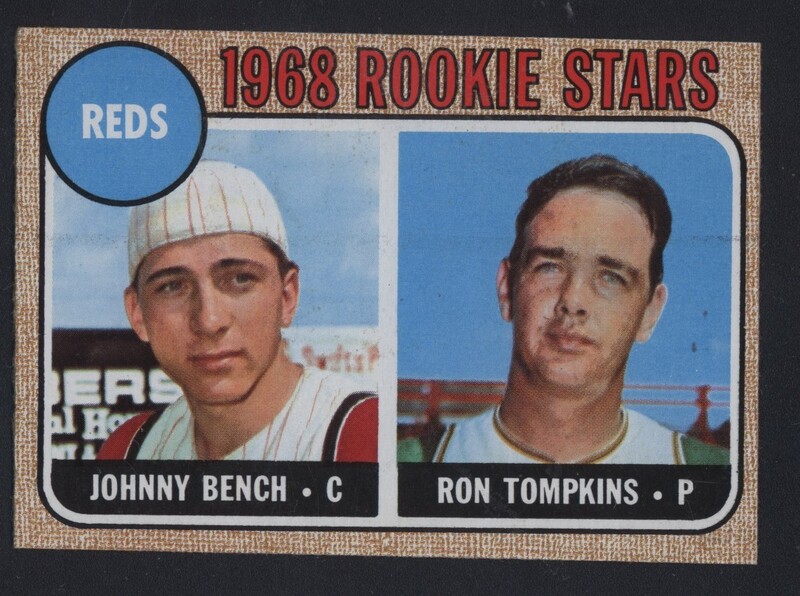 Aside from some centering issues, so typical of the ‘68s, this was an incredibly fresh group. Highlighted by multiple cards of Aaron, Clemente and Nolan Ryan as well as cards of Mickey Mantle and Johnny Bench, this was a very solid collection. One that Just Collect was very eager to purchase. After a full evaluation, Just Collect presented the seller with an offer that was accepted and the deal was completed. The seller still has more cards in his collection, and upon his return to the west coast, will decide whether to ship them to Just Collect for an offer or stop by next year during his annual visit back east. Needless to say, while the cards have survived and will be presented in upcoming auctions, we’re not so sure what happened to the ’68 Cutlass. Do you have a collection you are looking to sell, and have an interesting story behind it? Have you wondered what it is worth or what someone would pay for it? We’d love to hear from you! Call us today to find out what your collection is worth and how you will have a purchase offer as quickly as 24 hours!